Attorney General Marty Jackley announced the United States Supreme Court, in support of a Colorado cake artist’s constitutionally protected right to religious freedom, has reversed a civil rights commission ruling in the case of Masterpiece Cakeshop v. Colorado Civil Rights Commission. 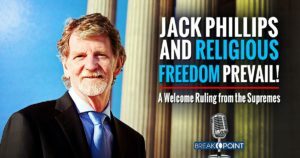 Jack Phillips, the owner of Masterpiece Cakeshop, appealed a state court decision he lost after he declined to create a cake because of his deeply-held religious belief that marriage is the union of one man and one woman. The Court recognized, the Commission’s treatment of Phillip’s case violated the State’s duty under the First Amendment not to base laws or regulations on hostility to a religion or religious viewpoint. South Dakota joined a 20 state coalition of Attorneys General in an amicus brief in September 2017.